This Chunky Rib Scarf Pattern is made using a simple 2 x 2 rib using a Chunky weight yarn. This pattern is for a fairly narrow scarf. 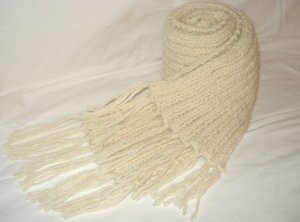 I knitted my scarf using a white 12 ply yarn composed of 50 percent Australian Wool, 30 percent Acrylic, and 20% Alpaca, and although the yarn is not 100 percent natural yarn, I am very pleased with the result. 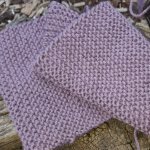 Although this scarf pattern is more 'difficult' than the Garter Stitch Scarf it is still easy enough for most beginners to make and the thicker thread and larger needles make this scarf a quick knit! This scarf is approximately 180 cm long without the fringe and 17 cm wide. To make this scarf, you will need approximately 300 metres of 12 ply yarn. If you are using 100 percent pure wool that equates to approximately 5 x 50gm balls of 8 ply wool. If you decide to use a wool blend or an acrylic the number of balls will be reduced as these types of wool weigh much less than pure wool. To make my scarf I used 5 x 50gms of Entwine (by Spotlight Australia). To knit this Chunky Rib Scarf pattern, you will need a pair of 7.00 mm single pointed needles (or the size required to give you the correct tension. The tension for this scarf is 16 stitches and 15 rows for a 10 cm square. Note: Your tension should be measured while your ribbed fabric is in its resting state - do not stretch your square when you are measuring it! 1st Row: K3, *P2, K2, repeat from * to last st, K1. 2nd Row: K1, *P2, K2, repeat from * to last three stitches, P2, K1. Repeat 1st and 2nd rows until your work measures 180cm. If you are happy with your scarf the way it is, then you have finished your scarf. But if you would like to add a special touch you can add a fringe although personally, I don't think this particular scarf needs a fringe. Cut 12cm lengths of yarn. Separate out two strands and fold in half. Using a crochet hook to pull the loop through the knitted fabric and then threading the ends through the loop to form a knot. Repeat along both edges of the scarf. Would You Like a Printable Copy of this Pattern? Just in case you would like to print out a copy of this Chunky Rib Scarf pattern, I have created a pdf version of it that you can download.